It is not a mango season. But when I saw fresh mangoes in market a week before, I felt like tasting it. So I bought a few mangoes. Then I decided to make mango thokku out of one. The one which I posted here is the recipe from my grandma. My mother-in-law used to prepare same kind of thokku for mixing it with rice and her version is different. I will be posting her recipe in summer during the mango season. My grandma makes this recipe often during mango season and most of the time it lasts only for a week or two. When it is prepared at home, we use it not only with curd rice, but also with paratha, roti, hot steamed rice, idly, dosa, sandwich and sometimes we use it as a condiment for papad too. This thokku is very addictive than pickle. You can also prepare it instantly. 1) Peel the skin of the raw mango and grate it nicely. 2) Heat a non-stick pan/ kadai. Heat oil in it. 3) Add mustard seeds when the oil is hot and not smoking. Let it splutter. 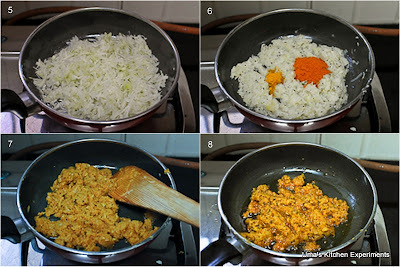 4) Immediately add Asafoetida. Make sure not to burn it. 5) Add grated mango and give a quick stir. 6) Cover and cook for 5 minutes in low flame. 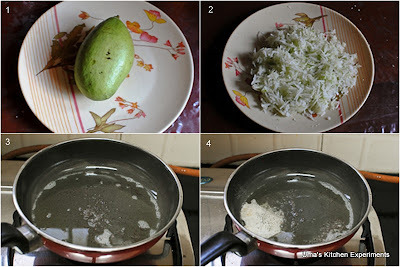 7) After 5 minutes, the grated mango reduces to half. Now add salt as per the mango quantity, turmeric powder and red chilli powder. 8) Saute it till the raw smell of red chilli powder goes off. 9) Add jaggery and roasted fenugreek powder if you are using(I didn't add both). Cover again and cook till the oil separates from the mango. It will again take 4-5 minutes. Make sure to keep it in low flame. 10) Switch it off and cool to room temperature. Store in dry, air tight container. It stays good for a month if stored in refrigerator. 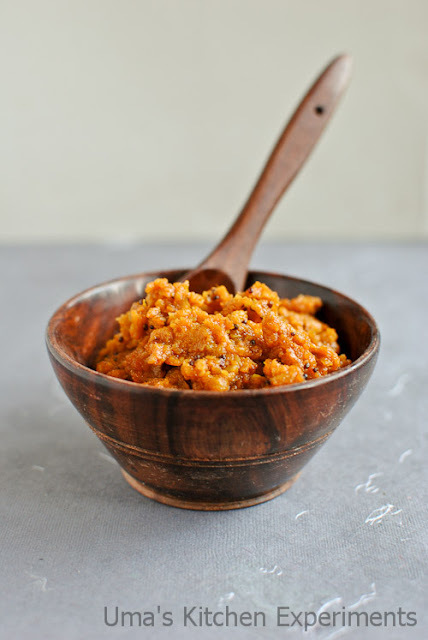 11) Goes well with hot steamed rice, Curd rice, Idly, Dosa and any type of parathas. 1) I used home made red chilli powder and hence I used more to get correct spicy level. If you use store bought red chilli powder, use less or more according to its spicy level. 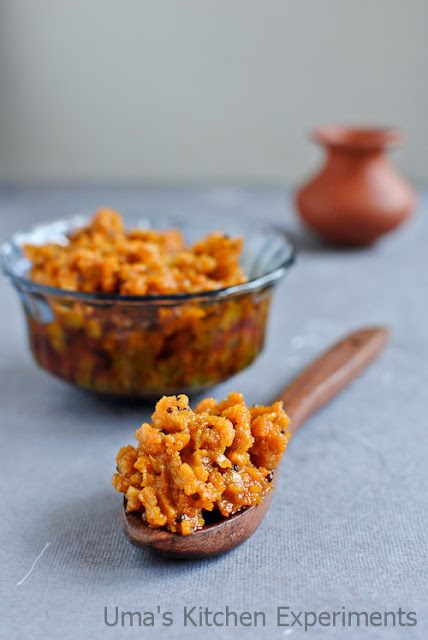 2) Taste a pinch of grated mango before preparing the thokku and check whether it is sour or not. If it is sour, add jaggery or you can skip it. 3) If you like, use roasted fenugreek powder to it. 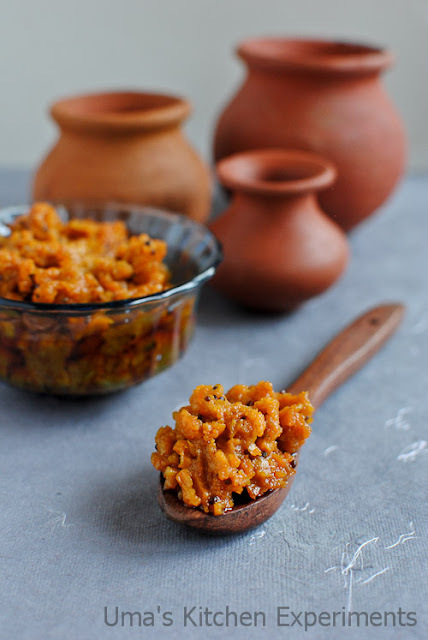 Who can resist to this droolworthy thokku..Feel like relishing some with a bowl of curd rice. Nice n cute props n lovely pics!! Give me a bowl of curd rice and mangai thokku! Delicious, mouth watering mango thokku. It's my favourite pickle! Looks very delicious! 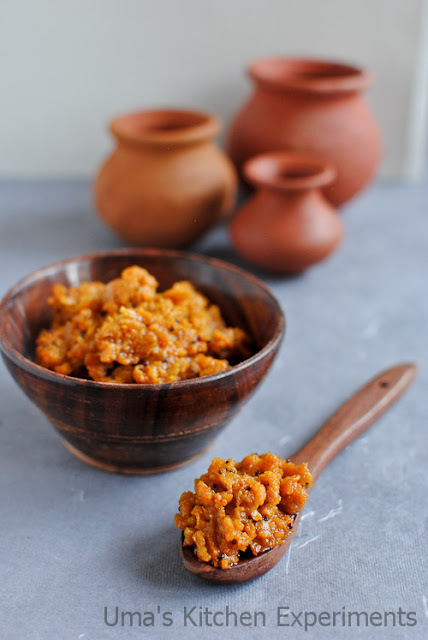 yummy thokku perfect for curd rice n dosa too..
That looks finger licking good! Delicious!